Windows 10: WinX Free DVD to iPod Ripper - Free Rip/Convert DVD to iPod Easily and Fast. This free DVD to iPod converter software for Windows 10/8/7/XP brings x2 faster speed than other similar DVD to iPod freeware in the market to rip DVD to iPod video formats while not resulting in any audio/video quality loss. Using WinX Free DVD to iPod converter, users can extract audio from DVD movie to save as MP3 music file. This DVD to Apple iPod converter is 100% free and clean with no malware, adware, spyware or virus at all. Bypass Disney X-project DRM which is the new encryption method adopted by Disney, Paramount and Warner. Update continuously to support all latest encrypted DVD movies, such as Inside Out and Star Wars: The Force Awakens. Freely rip and copy DVD to iPod, transfer DVD to iPad/4/Mini, iPhone/5S/5C, Apple TV, etc. Support iOS 9. Act as free DVD audio ripper to rip DVD into MP3/AAC/AC3 music file for playback on iPod. Save DVD movie scenes as PNG pictures. Profile Setting – This free DVD to iPod ripper has preloaded several preconfigured profiles to be chosen from will make your DVD conversion easier. This free DVD to iPod ripping software is capable of ripping DVD to iPod at superfast speed, which is x2 faster than common rippers. Integrated with high quality video encoding engine, you can assuredly get high sound quality and excellent image quality, as vivid as the original one. Click "to iPod Video" and choose one profile according to your iPod as your output format for DVD to iPod ripping. It is also provided with many other formats and profiles. Hit the "Run" button and go! Enjoy fast DVD ripping speed with this free DVD to iPod Ripper. The latest protected DVD usually has 99 titles and the DVD movie size is larger than 40 GB. When dealing with the newest protection system, almost all common DVD ripper software crash or work out of order. The advanced edition WinX DVD Ripper Platinum is able to remove this kind of strong encryption technology. It automatically selects the right DVD title for you and smoothly rips DVDs from the main movie content with correct order. I just tried the program with a DVD of mine, and it worked quickly and flawlessly. If you want a fast, effective, and fairly user-friendly DVD-ripping sosslution, WinX DVD Ripper Platinum is the way to go. 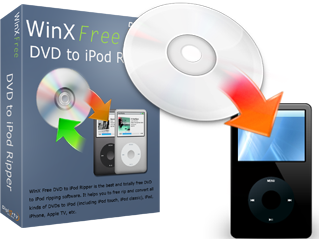 WinX Free DVD to iPod Ripper is the best free DVD ripping software that specially rip and convert any DVD to iPod touch 1-5/nano/classic, iPad, iPhone, Apple TV with splendid video and audio quality. It brings fast DVD ripping speed through simple operation. Totally free, 100% clean and safe. If you need to rip protected DVD to iPod, iPhone, iPad, PSP, Zune, Zen, you can try WinX DVD Ripper Platinum. Do you want to watch DVD movies on your favorite iPod any where and any time? This free DVD to iPod ripper can lead you to realize this fantasy. Through a few simple clicks, your DVD can be converted to iPod with high quality. The page includes all the best free WinX DVD rippers and converters. Choose and download a freeware to rip DVDs to MP4, AVI, WMV, FLV, VOB, PSP and more on Windows or macOS. It is awesome to enjoy music and videos on iPod Nano 7th generation, and even that from DVD. How to rip DVD to iPod Nano 7 for free? And how to find the best free DVD to iPod Nano 7 ripper? Before extracting DVD audio tracks into iPod, you should understand why iPod cannot read DVD. Using a professional DVD audio extractor for Windows (10) to extract and convert favorite DVD audio/music to MP3, AC3, etc. for playing on iPod. WinX DVD Ripper for Mac is a decent approach to convert and transfer impressive DVD songs into iPod, DVD music to iPod Touch, DVD rhyme to iPod Nano for all Apple, iPod, and Mac OS users. No, thanks. Download WinX Free DVD to iPod Ripper.